"Is this the famous Lake Palace of India", asks Jenny from Australia while waiting for a boat to take us to the Neermahal Palace, an imposing edifice set in the middle of a tranquil lake in Tripura where we have arrived to attend the International Tourism Mart focused to enhance tourism to the North Eastern part of the country. 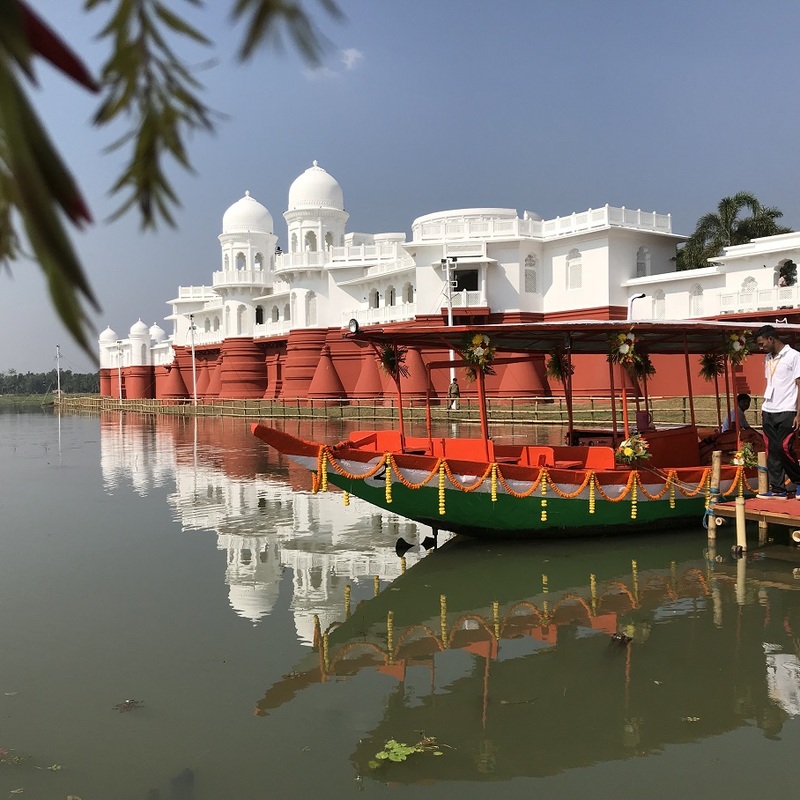 It's not unusual for first time visitors to get confused with the much-hyped Lake Palace in Udaipur in Rajasthan, both built by former Maharajas to beat the summer heat. I have seen only images of the other one, but when see in front this glistening white royal residence - crowned with several Mughal styled domes and standing on red-brick foundations, I find it as something as exceptionally beautiful and eye catching. Its reflections on the greyish lake water sprinkled with pink waterlilies amidst green foliage create a magical scene for me that I, like other onlookers, try to lock in my camera. At first sight, Tripura appears to be different from the rest of India with the typical crowd, chaos and cacophony missing. It's predominantly a hilly, landlocked region decorated with lush green valleys, rivers and streams, spreading lakes and pristine forests. Calmness and tranquillity – a rare commodity in vibrant India – can still be sensed there. Often referred as 'Daughter of Mother Nature', the grace and grandeur of Tripura's lush green landscape is heightened by its rich human resource reflected in the ethnic, linguistic and cultural diversity of the population, currently less than 3% of India's total of 1340 million. 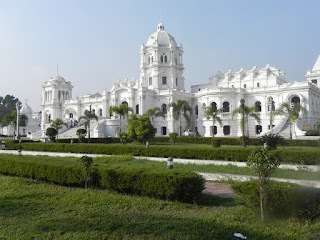 As a tourism destination, Tripura finds it difficult to compete with big brothers Rajasthan, Kerala or even Goa, but the state has many attractions to lure visitors for a few days. Besides splendid nature, the 10000 plus square km land offers varied sites from royal leftovers and stimulating rock art to many Hindu temples and rich craft and culture to trigger any traveller's quest for discovery. 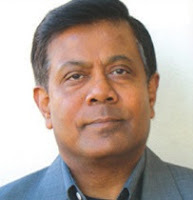 As per history books, Tripura achieved its golden era under the Manikya dynasty who ruled for almost 500 years until joining independent Indian Union in 1949. Their leftovers are always ranked at the top of any visitor's itinerary. Beside the Neermahal Palace, the other site of great significance is the Ujjayanta Palace in the heart of Agartala city. 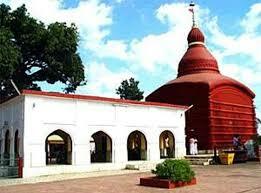 Religious tourism is big in Tripura; the region being is a treasure trove of Hindu and Buddhist faith. The archaeological ruins around Unakoti, Pilak and Devtamura, located 170 km away from the capital, display gigantic rock-cut carvings and stone images Shiva, Vishnu and other Hindu gods and Buddhist creeds. Experts believe them to be over a thousand years old, saying how talented the local civilisation was during the heyday. 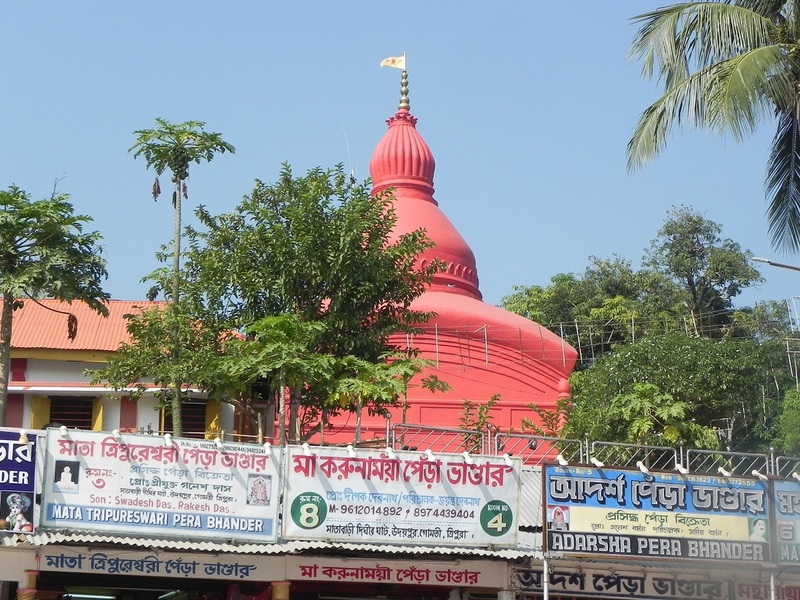 There are many Hindu temples throughout the state – most significant is that of Tripura Sundari – a version of Goddess Kali. Its located in Udaipur, 56 km from Agartala where, as per Hindu mythology, one of the 51 body pieces of Mata Sati fell, thus becoming a 'pith' or a revered holy site. No visit to Tripura is complete without paying a tribute at this pious junction. Similarly, it will be a big miss if anyone leaves Tripura without seeing the spectacled monkeys a rare and endangered species, Tripura and some other parts of North-East India being their stronghold. Luck permitting they can be spotted in the wild. Otherwise Sepahijala Wild Life Sanctuary, 28 km outside the capital boundary, is the place to meet them. 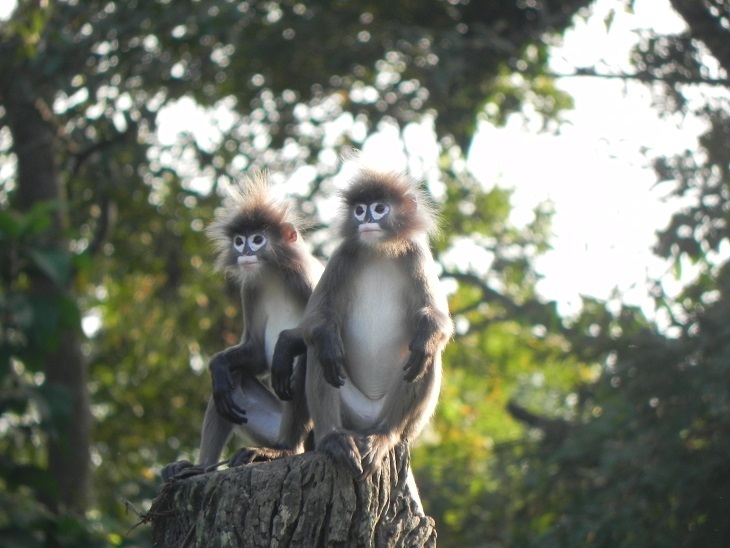 This 18 square km forest is a zoo where the star attraction is these rare types of langurs, who have white circles around their eyes as if wearing glasses. Their fashionable sights are surely a bonus of any Tripura odyssey. Tripura is very close to neighbouring Bangladesh sharing over 850kms of land boundary with a border check-post merely a few km away from Agartala where a military showbiz around sunset time has become Tripura's newest tourist drawcard. This pageant is similar to the famous 'Beating the Retreat' ceremony at the India-Pakistan border at Wagah in northern India but obviously of much lesser grandeur. Still, it's worth watching the pomp, which basically involves trumpet blowing, uniformed guards marching and then at almost sunset lowering the nation's flags. 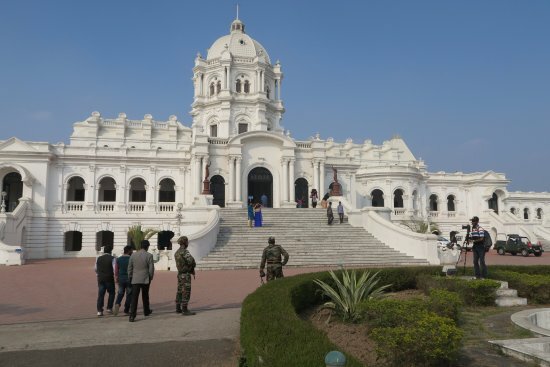 Efforts are now being made by both governments, India and Bangladesh, to make this a major tourist attraction on both sides which is hoped to draw more tourist attention from domestic and international market in the near future. Getting there – Singapore Airlines www.singaporeairlines.com from Australia to Kolkata from where there regular flights to Agartala. 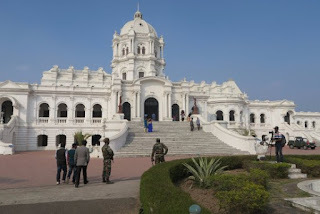 Accommodation – Modest accommodation at private hotels and government guest house are available, at Agartala Ginger Hotel www.gingerhotels.com being most popular.